The Gorman-Rupp Super T Series sewage and wastewater pumps with Eradicator™ Solids Management System are a series of self priming centrifugal pumps designed specifically for handling municipal and industrial wastewater containing stringy, difficult to pump, solids in suspension (such as “wet wipes” , rags and feathers). The Eradicator is equipped with a patented removable cover plate incorporating a lightweight removable inspection cover to allow faster and easier access to pump internals. Easier access to the impeller, increased uptime, improved operational efficiency, reduced maintenance costs and lower life-cycle costs are major benefits of the Eradicator system. The Eradicator™ system features an aggressive self cleaning wearplate, incorporating a number of notches and grooves as well as a patented lacerating tooth that helps break up stringy materials and pass them through the pump without impacting on performance or interrupting service. No longer does the entire cover assembly have to be removed to gain access to the impeller, as the special cover-plate of the Eradicator™ includes a patented lightweight inspection cover that can be easily removed if it is necessary to inspect pump internals. Eradicator™ pumps do not need expensive chopper blades (that require periodic replacement) to handle stringy solids. 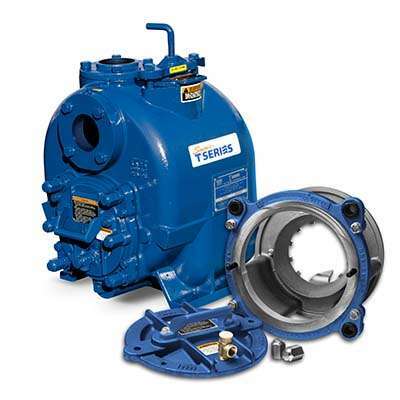 Pumps can also be supplied with hardened internals for abrasive applications.